First impression and initial thoughts – there seems to be a sort of standard box each month. An olive oil, a jam, a seasoning rub, some other type of sweet item, and then two sauces. Makes sense but it’s interesting to me. 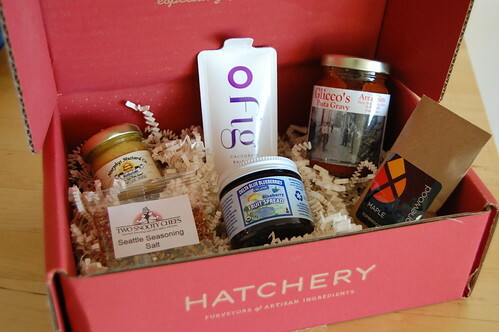 Also, that seasoning salt isn’t even on Hatchery’s website – they sell four others and according to the booklet, I should have received one of those. I would guess the producer just sent them a mixed box of samples. At a glance at the booklet, there’s one recipe I’m interested in making, using the pasta sauce. The mustard is making me want a pretzel!